TASK: Construct Borg vessels. Disseminate acquired resources. Parameter designation Delta Quadrant. Seed one at any mission with no affiliation icons OR build at such a mission (or at an assimilated planet) where you have a Borg ENGINEER. Transwarp Network Gateway. This card is ❖ universal now and it's game text and title have been changed. 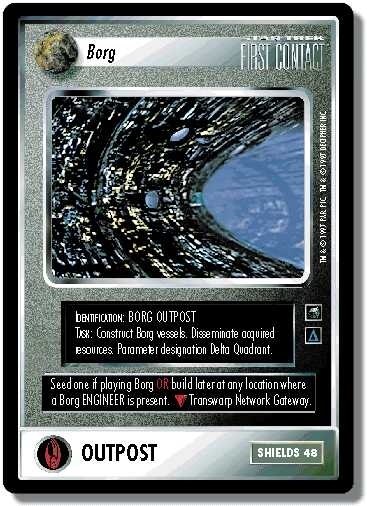 Game text before errata: "Seed one if playing Borg OR build later at any location where a Borg ENGINEER is present." 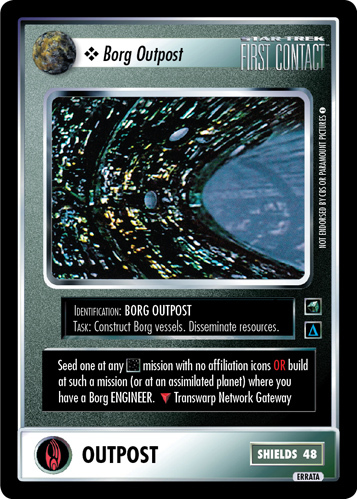 There are 26 entries for Borg Outpost (ST1E 4 C 37) at the Tradeplace (90 haves and 1 wants). Click here to see all trade list entries for this Common card!